I think my garage was as orderly as yours until roughly 4 hours after we started moving in! I took a fancy to those trains when I was a teenager. They had a starter set at a huge hobby shop in Manhattan. The shop was closing for the day so I had to grab it or forget about it for a while. Then we did the rest of what we planned that day, so I rode the elevators 88 stories up to the observation deck at the Empire State building with this immense box of trains! I figured I'd just get a loop of track and a couple of extra cars to run around the Christmas Tree: no big deal! These days it's easily a hundred feet of track and when my son and I need something to do on a rainy day we are running 20 car trains all over the house. Maybe someday we'll get the cog railway and start going upstairs too! -the frightening thing is I just went into 16mm with a similar beginning plan: "Just one machine and a coupla' films..."
Just adorable Steve!!! You are getting me into the Xmas spirit. Time to put on the "It's a Wonderful Life" reels. Hot Dog!! This weekend we took it on the road to Coastal Maine. 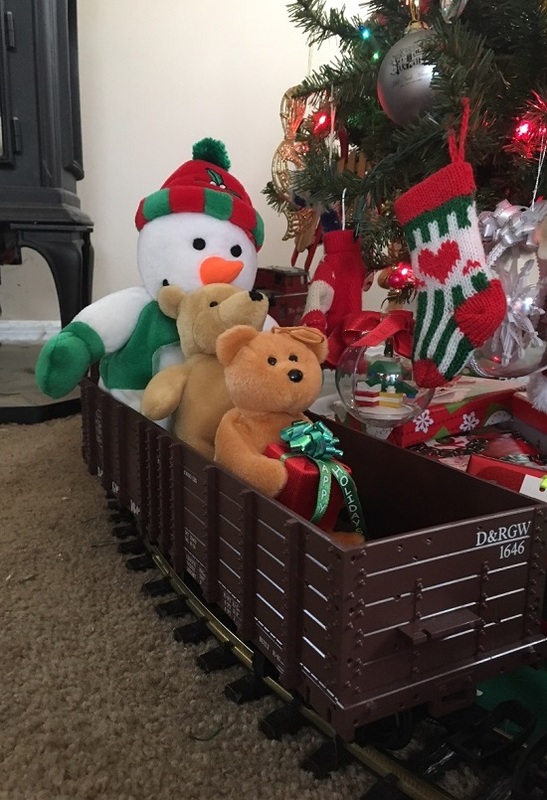 One of my favorite railroad museums anywhere has a special Christmas weekend every year and we’ve gone about every other year. Don’t get me wrong here: it wasn’t all trains: there were horse-drawn wagon rides, lobster dinners and shopping too! I like to think this is a pretty picture, but for reasons I don’t have a huge amount to do with, it is also an amazing picture. First of all, no vehicle in that picture is less than a hundred years old. The three coaches were in revenue service from before the turn of the last century until the Depression, and then in tourist and museum service here and there ever since. They are beautifully built: the woodwork and ironwork are no less than works of art. The engine is another story: she was in revenue service from the 1890s until the original line went under in the 1930s. Then some hobbyists trucked her down to Connecticut, where she sat in a shed for 60 years. (Sometimes we hobbyists bite off more than we can chew, right?) 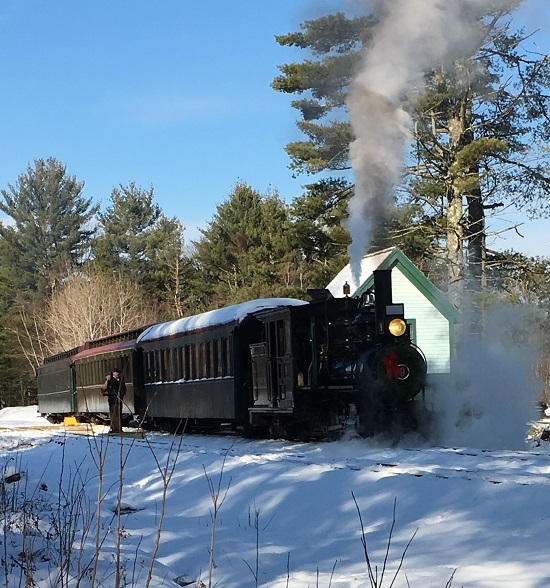 The museum trucked her back to Maine in the 1990s, did a very thorough restoration on her and a few months ago she took steam for the first time in 80 years. She may be headed for 130 years old, but for all intents and purposes this is a new machine. What’s also kind of amazing is absolutely nothing in the picture was there 20 years ago: no train, no track, no station, just a weedy path where the original railroad had been torn up prior to WWII. It’s amazing what a bunch of like-minded people can do when they work together. For my own part I shot two and a half rolls of Tri-X this weekend, because that is one of the great parts of Super-8 film and sometimes I almost forget that side of it. It took a little adjusting to using a camera with a lens cap again, but I enjoyed myself! A couple of months ago i came across a chap that I used to work with long ago during my 10 year stint with the local aero club. 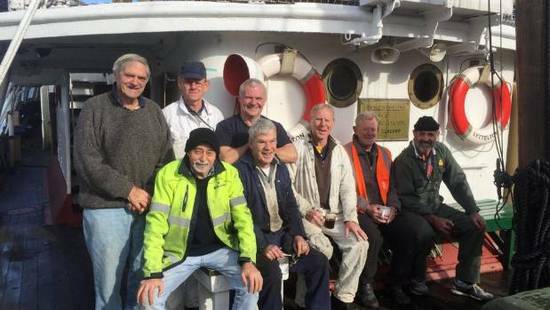 Jerry like myself are now retired but he told me how he is now involved the the maintenance of the old Steam Tug Lyttelton. 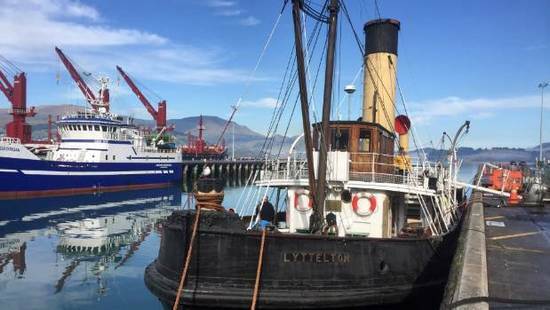 The tug was built by Ferguson Brothers in Port Glasgow on the Clyde and sailed from Scotland on the 2nd of June 1907 arriving after her 12000 mile journey under her own steam in Lyttelton 10th Sept 1907. Athough retired in the early 1970s the Presevation Society have been keeping her seaworthy ever since. Anyway in the weekend paper there was an article on the tug and the now society members who are struggling money wise to get her certified to take tourists out in the harbour. I do hope they can manage to get her back at sea as I remember the airline I once worked for doing an evening charter for the staff. It was a great night cruising the harbour where we dropped anchor in a inlet and got a rather large BBQ on her stern going. 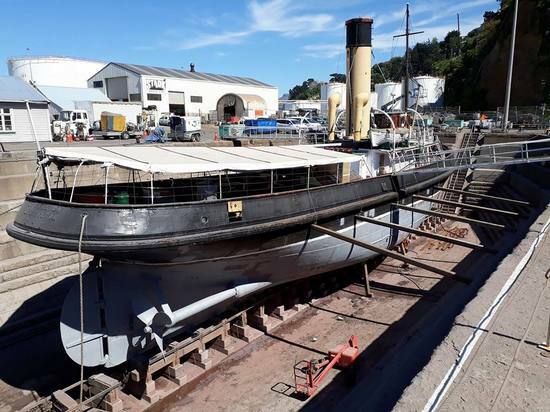 These days I guess its harder to find unpaid society volunteers to maintain and run the old steam tug plus obtain funding...which is a shame if she becomes laid up as a static exhibit. Connor with old "Shark Boy and Lava Girl" 3D glasses just prior to running that reel...he thought it was pretty good. It’s a tropical 11 degrees Fahrenheit here on the Sunny North Shore of Long Island, New York: that’s 9 below zero to my Metric Brethren! 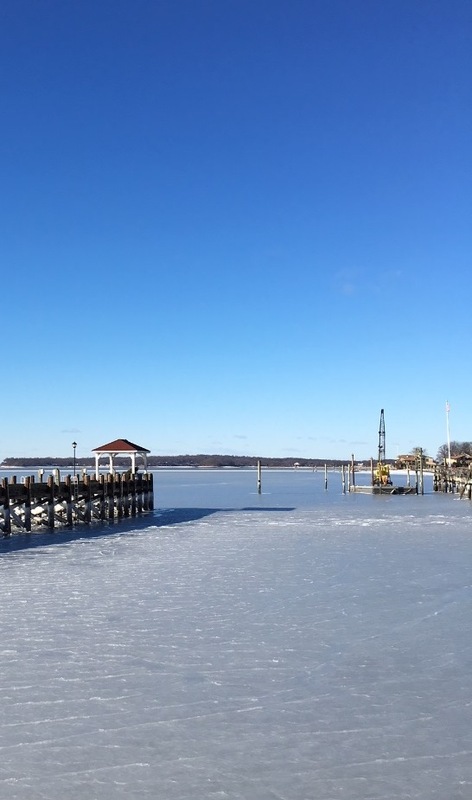 We went up to the harbor this afternoon and saw something we don’t see very often: ice from shore to shore. Being that this is seawater it takes some serious cold weather to freeze it, and it’s been serious this past week for sure! We were sitting watching the Gulls going about their business. They’d land on a surface and very soon pull one foot inside their feathers and in ten or fifteen seconds switch to the other. 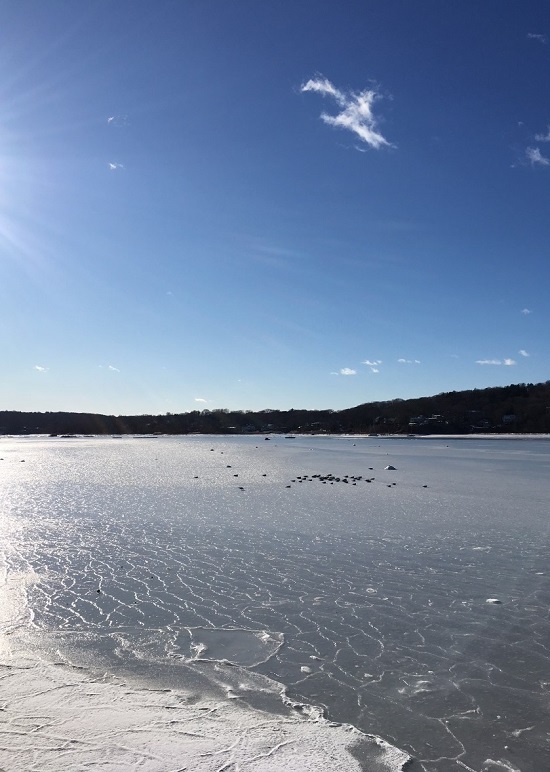 A whole flock landed on the ice and very quickly laid flat on their bellies like ducks: in this case even putting down one foot wasn’t an option. 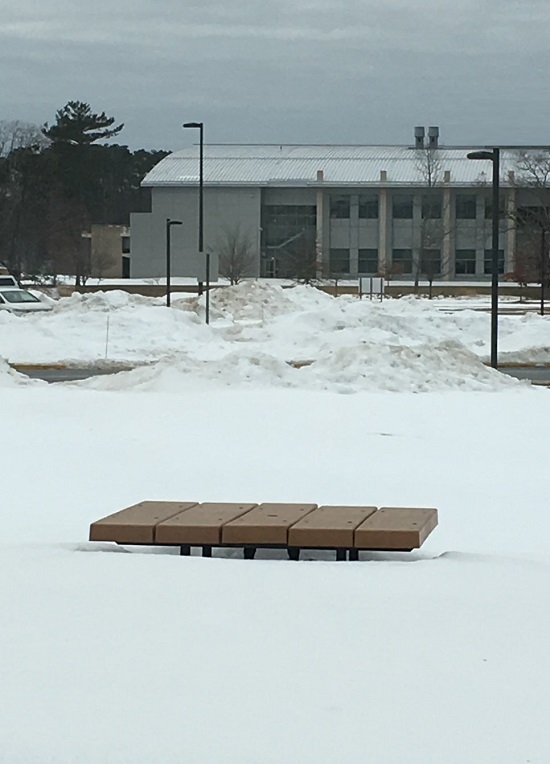 -but we’ve reached the stage of life where we’ve seen so many seasons pass we don’t become despaired by it being this cold: you shovel the walk a couple of times, you build a hot fire in the hearth once or twice and sure enough Spring will be here again! Enjoy your Summer, Graham! They pass quickly as well! 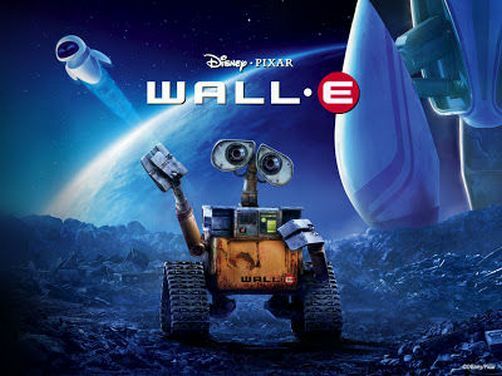 We LOVE Wall-E! Why do you have to live so far away??? Thank you, Graham! Actually would love that. Maybe someday I'll get to travel more. Great photo, but I'm in part of the country that's strangely NOT cold! Condolences to the rest, though. It's 5 degrees F right now in Massillon Ohio. It was -2 this morning when I started working. Its been miserable this past week. Warming up in the 30's next week and there will be people in shorts, I guarantee! Well I have just finished splicing a Scope print of "Oz The Great and Powerful" for a screening in the near future. ...it will be interesting to see what its like. 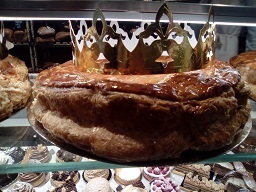 Today in Belgium, many people will eat what could be translated as the "Kings'Cake" (la galette des Rois in French), reference to the Wise Men (in French, les Rois Mages). A little object is hidden in the cake and if it's in your slice, you're the king or the queen. The French have the same tradition but they tend to eat this special cake all the month long. It's a very delicious cake. Looks yummy Dominique...what's the small object that's put into it? Reading about the weather today in the US...hope it improves as it sounds very cold indeed. Last night I sat and watched some of our old home movies. My spare GS1200 for a while now, would not run at 18fps, however a good prod with a cotton bud on the 18fps "trim pot" brought it back to life. Another screen shot from last night, the digital camera did not like the movement....but it does show the colors still look great, anyway, now that this three bladed GS is again running, I will watch some more old home movies very soon. My cat Buster loves being around me when I'm working with film or my projectors. 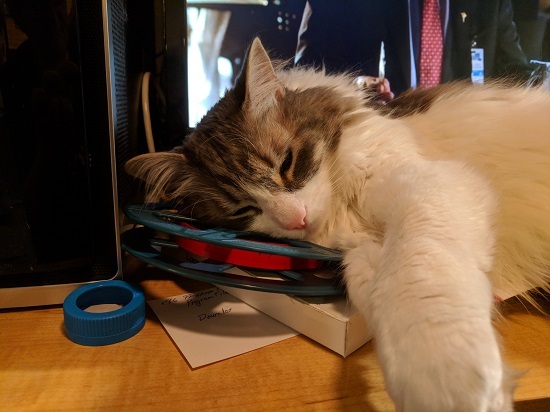 Tonight while I was doing some telecine work Buster jumped up on the computer desk right next to me and found a cozy reel of film for a headrest. -I do believe I'll eat lunch at my desk a while! Janice: My absolutely greatest Cat and Film moment came about a dozen years ago: I was screening "Gone Nutty" and one of the cats meandered through. All of a sudden she was confronted by a three foot tall, fanged squirrel! -She almost...soiled the rug that day! I went to a meeting in another, much older building here at work. I found this wonderful relic of past times. 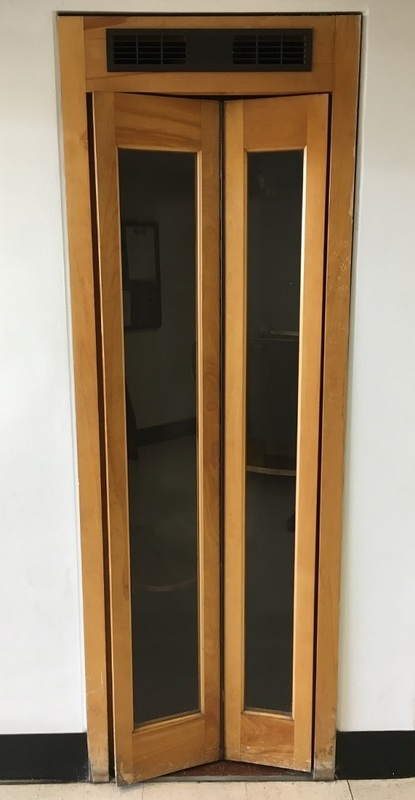 It’s called a “phone booth” (fohn büth). This was a place you went when you had a flat tire or you needed a taxi or you were a superhero in need of a quick costume change (Where do they go now?). If you wanted to ask somebody out and you didn’t want your little brother overhearing, a handful of change, one of these and a little courage was all you needed. This is a really nice one: the woodwork looks to be oak. Everything feels solid, like it was meant to last a century. For better or worse in the last twenty years they’ve gone from being a life essential to a waste of space. This one doesn't have a payphone in it, and probably hasn’t within our decade. The lights don’t come on when you close the door anymore either. It’s almost begging for a purpose: maybe somebody should hang a sign above it “Have your cell phone arguments HERE!”. (It is soundproof, after all…). The building where I work was a muddy field as recently as 2009. There are no phone booths, and there aren’t any roll-up screens either. Yet who knows what relics they’ll find when they decommission us in 2035! -One way or another, I don’t intend on being at Work that day! Time passes relentlessly. I remember thinking my parents were old when they were much younger than I am today, but time moved forward and now their aches are mine! 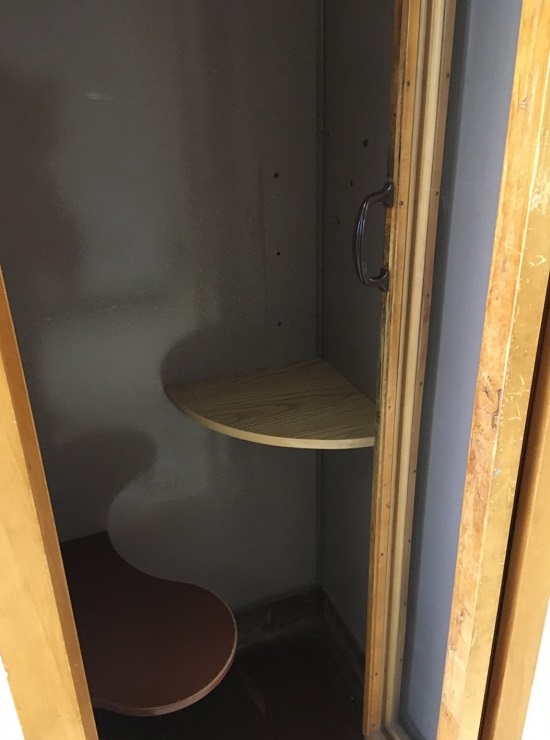 This empty little room is a great symbol of this. I kind of miss there not being a nice, robust pay-phone inside there, but I took these pictures with my own cell phone, didn’t I? My son is 15 years old. When he was little people were already walking around with phones in their pockets and pay phones were few and getting fewer. Just for laughs I’m going to send him these pictures and see what he thinks that odd little room is for. -He loves history: I think we have a shot here! -As I said: Seasons pass. It'll be spring here...eventually! 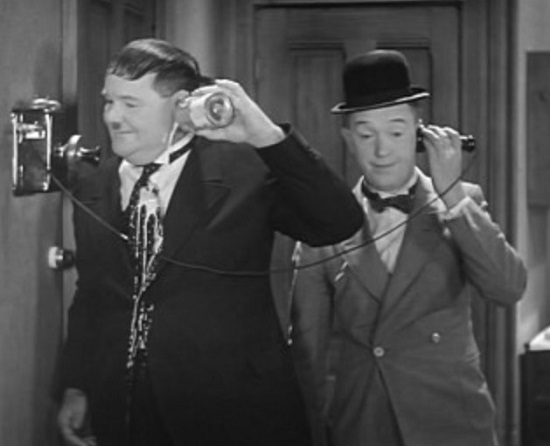 Of course, the humble phone booth played a huge supporting role in just about every movie made up until the advent of cell phones, and was an essential prop in the Laurel & Hardy shorts! -if I ever set up my dream home cinema I'd have to have one of these set up in a corner somewhere! I'd want the phone to be the kind with the mouthpiece mounted to the front, though. 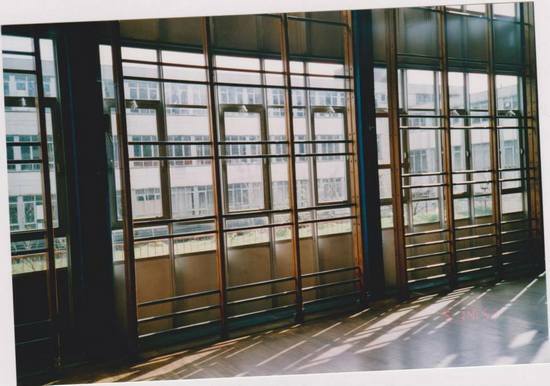 -For the record: my son knew exactly what that strange little room is, but in all fairness he may also be the only teenager on the planet that knows what 9.5mm film is (Thanks, Paul!). The interesting part of that whole story is how cellphones made it possible. If I didn't have a cellphone on me I wouldn't have been able to get the pictures, then again if everybody didn't have a cellphone on them there wouldn't have been a story in the first place! It's held in the Physics building. However, I actually may have made a material contribution to the Sciences last night. -For all I know it's a calculation to perk the best possible pot of coffee, but if it really IS Nobel Prize level stuff, I deserve credit for stopping my teacher from erasing that chalkboard! 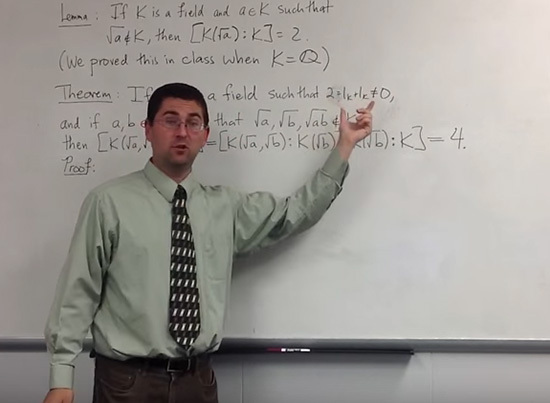 Steve...That black board looks very much like what the board looks like at one on my son Adam's Algebra or Calculus classes. For fun...I'm going to send the pic to him too see if he know what it is. 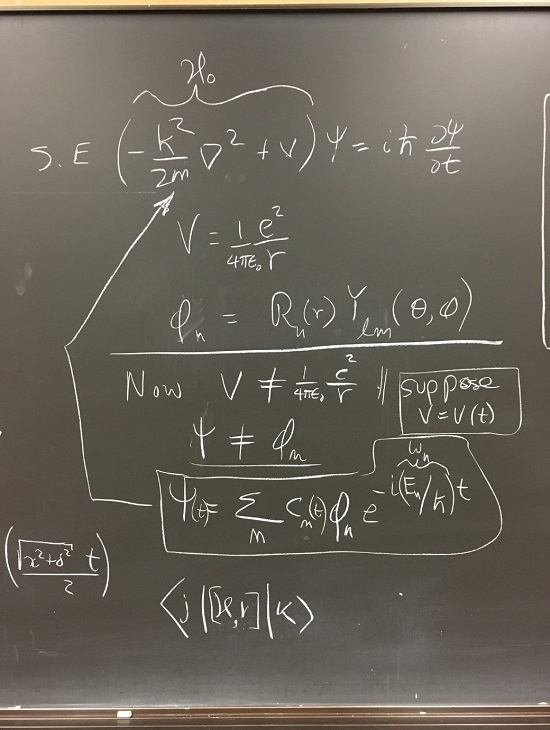 I suspect the blackboard is describing some math related to the wave equation from physics. -I'm a lot more likely to come over and say hello than wave! Steve we used to call them a "Phone Box" it wasn't until my father retired, that we got our first phone, it was a big thing to have your own phone, before that it was the "phone box" down the street. 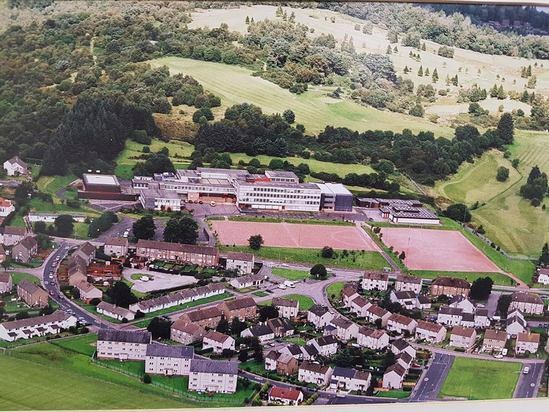 One of the amazing things about the internet of late, was coming across those old photos of the high school in Scotland I went to until I left at 15yrs in 1967. 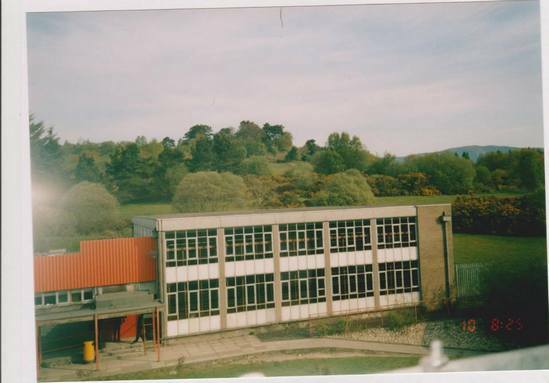 This school building has now been demolished, when I look at photos of a place I have never seen since leaving it, it certainly brings back memories. Back then, if you stepped out of line, you got the belt...and remember once getting it after being caught running along a corridor during a lunch break, some of those teachers were down right nasty. The Gym..."P.T"...known as "Physical Torture"